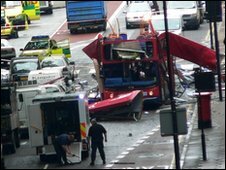 It would be "impossible" to reveal secret MI5 files about the 7/7 London terror attacks, a court has been told. The claim has been made at a hearing to decide the format of inquests into the deaths of those killed in 2005. Lawyers for the families of those who died argue the hearing should also look at whether the intelligence services could have prevented the attacks. Counsel for the home secretary and MI5 argued examining MI5's involvement was outside the scope of the inquests. Four suicide bombers detonated their devices on three Tube trains and one bus killing 52 innocent people. It emerged after the attacks that security agencies came across two of the bombers in 2004 while investigating other terrorist plots. But they were not considered to be of sufficient interest to be put under surveillance. The hearing at the Royal Courts of Justice heard there would be no problem with providing highly sensitive intelligence material to the coroner and counsel to the inquests. But any jurors could only see the material if they all underwent intrusive "developed vetting" and neither the bereaved families nor their lawyers would be allowed to see it. Neil Garnham QC, counsel for the home secretary and MI5, said the two official reports about the attacks by the Intelligence and Security Committee (ISC) - made up of security-cleared MPs - had adequately investigated MI5's involvement. He added there was "overwhelming" public interest in not having top secret MI5 documents revealed in the hearings. The coroner, Lady Justice Hallett, asked whether it would be possible to restrict the intelligence material discussed in the inquests to that related to the 7 July attacks. She said: "The families want to know why the decisions were taken in the way they were, and to put questions." But Mr Garnham suggested a problem would arise because it was necessary to put the decision not to place the 7 July bombers under surveillance in context of all the other investigations MI5 was carrying out at the time. He said: "It is difficult to see how that can be done without, metaphorically speaking, handing over the keys to Thames House." The coroner also revealed she went on the internet to read conspiracy theories about the attacks.